“Be careful where google maps sends you”. I have heard this warning before. But, as most of our travels have involved walking, it was rather easy to make sure we didn’t blindly head down a back alley. When walking you are going slow enough to turn around if something does not feel right. As well, you can use the google street view ahead of time to make sure of the route. Not that we are ever that cautious. Fast forward to travelling the world in a rented car, starting in Cape Town, South Africa. If driving on the wrong side of the road and sitting on the wrong side of the car are not bad enough, welcome to one of the most violent cities we have ever been to. But, we were sufficiently warned, not only by our government but by our airbnb host as well, where to stay away from. Mostly, it is safe, if you follow certain rules of thumb. We were particularly cautioned about the townships and settlements. We were advised not even to drive through those areas by ourselves. There are tours you can book to safely see the townships. I couldn’t imagine doing that, peering into other people’s neighbourhoods from a bus. I’m not one to go on a tour of where movie stars live in Los Angeles either. That is not my thing, no worries, we won’t do that. And then, on our last day in South Africa, we ended up following google maps for a scenic drive East, along the water. What we did not consider was, at some point we had to turn away from the water and go North to the airport. The only way to do that, was through Mitchells Plain. As soon as I saw the sign, I got worried. I had read about this place and something told me, this was not where we should drive through. At first it is not so bad and you kind of relax a bit. The town houses are not great, but they have high walls and are being protected with security signs, as is the case in most of Cape Town. So that was fine. But as we continued on, it got worse. It was later, when I read about Mitchells Plain that I realized what we had done. That and the fact that my husband later admitted to searching for an escape around every corner, in the worst parts of that drive. He was prepared to get us out of there, come what may. We had passed the point of no return. There was not even a way to turn around, if we wanted to. Conceived of as a ‘model township’ by the apartheid government, Mitchells Plain was built during the 1970s to provide housing for Coloured victims of forced removal due to the implementation of the Group Areas Act. If you are interested in this part of Cape Town history, you can visit the District 6 museum. But I found it too heartbreaking to see. I couldn’t manage another view of how mankind has been cruel to each other in history. Originally, the township was laid out in terms of the neighbourhood unit concept with large open spaces, localised public facilities and wide arterial routes. Various forms of housing were provided including, freestanding, semi-detached and duplex housing. Some of which still stand today. However, by the late 80’s and 90’s, major areas of Mitchells Plain deteriorated into urban ghettos. 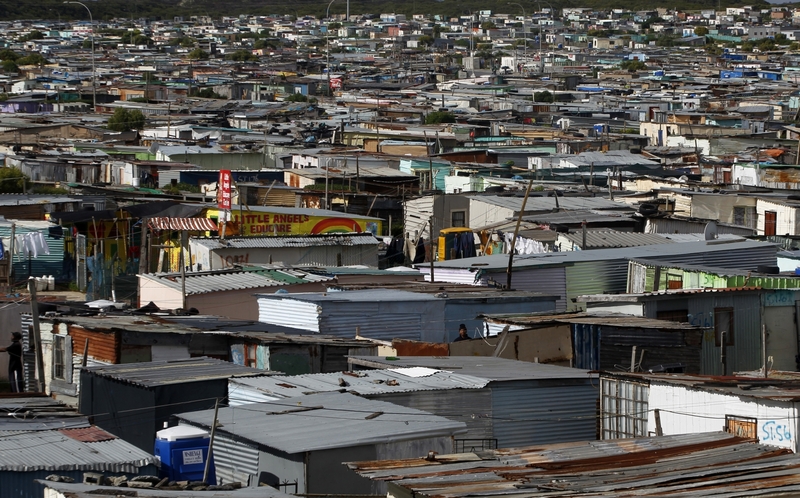 Gangsterism and drug abuse have increased and a number of informal settlements have sprung up in several areas. The informal settlements are what is most shocking to see. People just put up a structure and call it home. 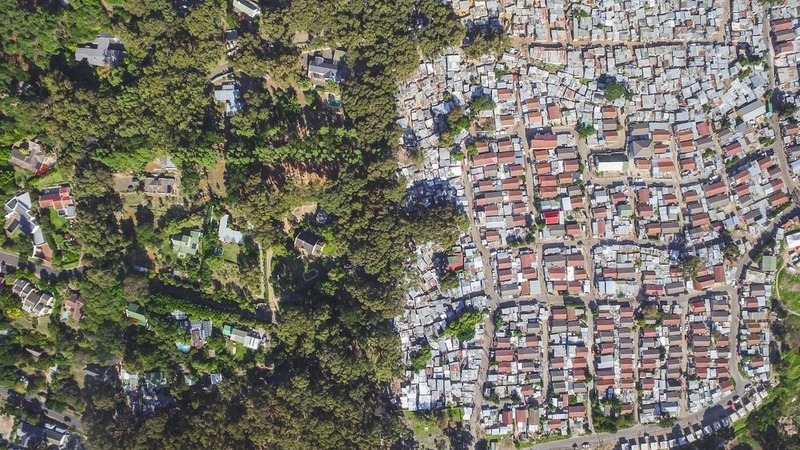 There are drone shots of Cape Town which show these settlements butting up to really posh neighbourhoods. It is such a strange thing to see in real life. It is just one of many problems with governance and civic planning in Cape Town. In the end, I never felt in real danger. In fact, our teens were completely unaware of anything being out of sorts. I left South Africa feeling very conflicted. The natural beauty of the Cape is spectacular. More than I expected. There are signs of a country that is healing. But, the reconciliation process is going to be a long and arduous road. With so much poverty and inequality to overcome, there are no easy answers. I guess the only way to think of it, is with hope. Just when I thought we were in the clear, we were ‘googled’ again. This time she took us through a zig zag of green houses to get to our Airbnb rental in Castell de Ferro. Clearly not as much of an alternate route as the Cape Town fiasco. However, it sure was a strange way to enter town. Not a picturesque drive into a charming village with a lovely beach and promenade, which is what you could see. Instead you jog through some of the green houses you can see from the highway above. Actually, it was shocking to see so many greenhouses in such a small space of land. I’ve never seen so many. However, that is nothing compared to another area of Southern Spain called the ‘Sea of Plastic’ and ‘the vast expanse of polytunnels’. 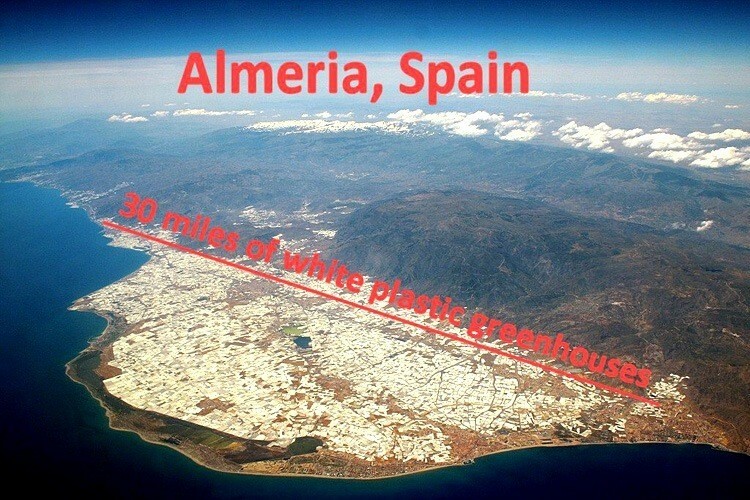 Greenhouses cover every square inch of more than 165 square miles of land around Almeria, Spain. More than the shocking look of it, though, is the reported human cost. Evidently the labour is mostly imported from Africa, with little regard to proper paperwork, working conditions and minimum wages. Those are the allegations. How much of it is true, I couldn’t say for sure. But the whole greenhouse industry in Southern Spain is disturbing. In Almeria, where the operation is most intensive, even the climate is being changed. Reports claim, the average temperature is cooler from the reflective effect of the plastic. Because the farms are largely hydroponic, the inputs of fertilizer, herbicide and pesticide are excessive. That residue is flowing into the Mediterranean Sea. The workers toil through intolerable temperatures and working conditions for much of the year. All of this, so that people in Europe can eat fresh vegetables, off-season. I know the situation is the same in North America. It is just the locations and the nationalities of workers which go by different. Up in Canada, we want fresh veggies, deep in the winter months. I guess the difference being, I have never seen the operations before. And it does give me pause. I’ve always attempted to eat produce as local as possible and in-season for the area I am in. But an intensive green house operation, like seen in Almeria, makes me question everything. When I am home, staring down the winter in Canada, I am going to have to re-think what it means to be local and in-season. I think what I find most alarming in both situations which google took us through, was the human costs. The settlements in Cape Town, for example, already get their water from stand pipes. For those residents, standing in line and carrying your water is already a reality. The threat of day zero will only change how much water they will be allowed to carry per person, per day. The inequality across the municipality of Cape Town is starkly divided, still. Endemic poverty is a major social problem, with no easy solutions. Then to think of the hundreds of thousands of migrant workers in the big agriculture businesses, not just in Spain, but all over the world. Why do we place such a low value on the food which brings us life, over other consumer commodities? It is shameful. As a tourist, it is really difficult to make good choices. Being able to get to farmer’s markets is not practical. In our present situation, it is not feasible for me to vote with my money. But, when I get back home in August at the start of the fall harvest, I am going to have a renewed sense of where I allocate my food spending. I had taken a step back from this practice in recent years, I found it too exhausting to grocery shop and question every item. But, not anymore. I cannot remove the sea of plastic from my memory. I will add a section to my website about how we are eating, local and in-season. It is going to be interesting to go back into our collective memory and think about how my grandmother would have done things. Along with that learning, the challenge will be, how to make it modern and taste good for my family’s palette? This is an experiment in sustainability I have always been interested in. Only now I have the time to devote to finding the solutions which will work for my family. ← Why don’t they teach wellness in school?